The brave women of Kobani – where Syrian Kurds are desperately fighting ISIS/ISIL/Daesh – are about to be betrayed by the “international community”. These women warriors, apart from Caliph Ibrahim’s goons, are also fighting treacherous agendas by the US, Turkey and the administration of Iraqi Kurdistan. 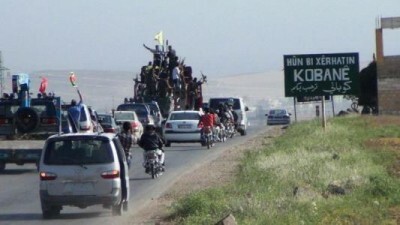 So what’s the real deal in Kobani? In Rojava, decision-making is via popular assemblies – multicultural and multi-religious. The top three officers in each municipality are a Kurd, an Arab and an Assyrian or Armenian Christian; and at least one of these three must be a woman. Non-Kurd minorities have their own institutions and speak their own languages. Among a myriad of women’s and youth councils, there is also an increasingly famous feminist army, the YJA Star militia (“Union of Free Women”, with the “star” symbolizing Mesopotamian goddess Ishtar). The symbolism could not be more graphic; think of the forces of Ishtar (Mesopotamia) fighting the forces of ISIS (originally an Egyptian goddess), now transmogrified into an intolerant Caliphate. In the young 21st century, it’s the female barricades of Kobani that are in the forefront fighting fascism. Inevitably there should be quite a few points of intersection between the International Brigades fighting fascism in Spain in 1936 and what is happening in Rojava, as stressed by one of the very few articles about it published in Western mainstream media. If these components were not enough to drive crazy deeply intolerant Wahhabis and Takfiris (and their powerful Gulf petrodollar backers) then there’s the overall political set up. The fight in Rojava is essentially led by the PYD, which is the Syrian branch of the Turkish PKK, the Marxist guerrillas at war against Ankara since the 1970s. Washington, Brussels and NATO – under relentless Turkish pressure – have always officially ranked both PYD and PKK as “terrorists”. What the PKK – and the PYD – are striving for is “libertarian municipalism”. In fact that’s exactly what Rojava has been attempting; self-governing communities applying direct democracy, using as pillars councils, popular assemblies, cooperatives managed by workers – and defended by popular militias. Thus the positioning of Rojava in the vanguard of a worldwide cooperative economics/democracy movement whose ultimate target would be to bypass the concept of a nation-state. Not only this experiment is taking place politically across northern Syria; in military terms, it was the PKK and the PYD who actually managed to rescue those tens of thousands of Yazidis corralled by ISIS/ISIL/Daesh in Mount Sinjar, and not American bombs, as the spin went. And now, as PYD co-president Asya Abdullah details, what’s needed is a “corridor” to break the encirclement of Kobani by Caliph Ibrahim’s goons. For Turkish Defense Minister Ismet Yilmaz, “the main cause of ISIS is the Syrian regime”. And Prime Minister Ahmet Davutoglu – who invented the now defunct “zero problems with our neighbors” doctrine in the first place – has repeatedly stressed Ankara will only intervene with boots on the ground in Kobani to defend the Kurds if Washington presents a “post-Assad plan”. And then there’s that larger than life character; Turkish President Tayyip Erdogan, aka Sultan Erdogan. Sultan Erdogan’s edicts are well known. Syrian Kurds should fight against Damascus under the command of that lousy fiction, the reconstituted (and to be trained, of all places, in Saudi Arabia) Free Syrian Army; they should forget about any sort of autonomy; they should meekly accept Turkey’s request for Washington to create a no-fly zone over Syria and also a “secured” border on Syrian territory. No wonder both the PYD and Washington have rejected these demands. Sultan Erdogan has his eyes set on rebooting the peace process with the PKK; and he wants to lead it in a position of force. So far his only concession has been to allow Iraqi Kurd peshmergas to enter northern Syria to counter-balance the PYD-PKK militias, and thus prevent the strengthening of an anti-Turkish Kurdish axis. At the same time Sultan Erdogan knows ISIS/ISIL/Daesh has already recruited up to 1,000 Turkish passport holders – and counting. His supplemental nightmare is that the toxic brew laying waste to “Syraq” will sooner rather than later mightily overspill inside Turkish borders. Watch those barbarians at the gates Caliph Ibrahim’s goons have already telegraphed their intention to massacre and/or enslave the entire civilian population of Kobani. And yet Kobani, per se, has no strategic value for ISIS/ISIL/Daesh (that’s what US Secretary of State John Kerry himself said last week; but then, predictably, he reversed himself). This very persuasive PYD commander though is very much aware of the ISIS/ISIL/Daesh threat. Kobani is not essential compared to Deir ez-Zor (which has an airport supplying the Syrian Arab Army) or Hasakah (which has oil fields controlled by Kurds helped by the Syrian Arab Army). Kobani boasts no airport and no oil fields. On the other hand, the fall of Kobani would generate immensely positive extra PR for the already very slick Caliph enterprise – widening the perception of a winning army especially among new, potential, EU passport holder recruits, as well as establishing a solid base very close to the Turkish border. Essentially, what Sultan Erdogan is doing is to fight both Damascus (long-term) and the Kurds (medium term) while actually giving a free pass (short-term) to ISIS/ISIL/Daesh. And yet, further on down the road, Turkish journalist Fehim Tastekin is right; training non-existent “moderate” Syrian rebels in oh-so-democratic Saudi Arabia will only lead to the Pakistanization of Turkey. A remix – once again – of the scenario played out during the 1980s Afghan jihad. As if this was not muddled enough, in a game changer – and reversing its “terrorist” dogma – Washington is now maintaining an entente cordiale with the PYD. And that poses an extra headache for Sultan Erdogan. This give-and-take between Washington and the PYD is still up for grabs. Yet some facts on the ground spell it all out; more US bombing, more US air drops (including major fail air drops, where the freshly weaponized end up being The Caliph’s goons). A key fact should not be overlooked. As soon as the PYD was more or less “recognized” by Washington, PYD head Saleh Muslim went to meet the wily Kurdistan Regional Government (KRG) leader Masoud Barzani. That’s when the PYD promised a “power sharing” with Barzani’s peshmergas on running Rojava. Syrian Kurds who were forced to abandon Kobani and exile themselves in Turkey, and who support the PYD, cannot return to Syria; but Iraqi Kurds can go back and forth. This dodgy deal was brokered by the KRG’s intel chief, Lahur Talabani. The KRG, crucially, gets along very well with Ankara. That sheds further light on Erdogan’s game; he wants the peshmerga – who are fierce enemies of the PKK – to become the vanguard against ISIS/ISIL/Daesh and thus undermine the PYD/PKK alliance. Once again, Turkey is pitting Kurds against Kurds. Washington for its part is manipulating Kobani to completely legitimize – on a “humanitarian”, R2P vein – its crusade against ISIS/ISIL/Daesh. It’s never enough to remember this whole thing started with a barrage of Washington spin about the bogus, ghostly Khorasan group preparing a new 9-11. Khorasan, predictably, entirely vanished from the news cycle. In the long run, the American power play is a serious threat to the direct democracy experiment in Rojava, which Washington cannot but interpret as – God forbid! – a return of communism. So Kobani is now a crucial pawn in a pitiless game manipulated by Washington, Ankara and Irbil. None of these actors want the direct democracy experiment in Kobani and Rojava to bloom, expand and start to be noticed all across the Global South. The women of Kobani are in mortal danger of being, if not enslaved, bitterly betrayed. And it gets even more ominous when the ISIS/ISIL/Daesh play on Kobani is seen essentially for what it is; a diversionary tactic, a trap for the Obama administration. What The Caliph’s goons are really aiming at is Anbar province in Iraq – which they already largely control – and the crucial Baghdad belt. The barbarians are at the gates – not only Kobani’s but also Baghdad’s.